A BOOK written by Melksham teenager, Evie Clover, who died last year, has been published to raise money for the charity set up in her memory. The book, ‘Written by the Stars, was written by Evie when she was 12. It tells the story of young girls breaking years of tradition to make their own destiny. 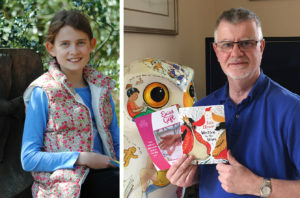 All proceeds of the book will go to Evie’s Gift, the charity set up by Evie’s parents, Bryan and Patsy, following her death in January last year after being diagnosed with a brain tumour at the age of 13. The charity offers support to families whose children have been admitted to hospital. Evie’s father, Bryan, explained, “In September 2016, at the age of 12, our daughter Evie wrote a short story to enter a writing competition for all the schools in Bath. “She had to write a story of about 5,000 words suitable for 4-7 year old children. She wrote her story and submitted it. We received a very nice letter back from Paragon Publishing saying that the story was incredible and would have won, but they felt that it was better pitched at 10-12 year-old girls. “The story was a ‘dual narrative’ and dealt with girls breaking hundreds of years of tradition and historical patriarchy and being able to decide their own destiny. It was called ‘Written by the Stars’. “Fast forward to February 2018 and shortly after Evie’s funeral we were contacted by the lady at the Royal High School, Bath, who had coordinated the school’s entries for the competition. She had remembered how impressed Paragon had been at the quality of her story and had got in touch with them to tell them about her brain tumour and how we set up Evie’s Gift to help the parents of critically-ill children. “They decided to publish the story – for free. The story was edited, and they convinced one of America’s top children’s book illustrators, Dinara, to illustrate it for no fee. The book is now in print. All proceeds from the sale of the book are being donated to Evie’s Gift. Evie’s book is available to purchase from the charity’s website for £7.99: www.eviesgift.org.uk.